“I can’t believe we’re paying to see something we get on TV for free!” Homer complains at a theatrical treatment of Itchy & Scratchy. “If you ask me, everybody in this theater is a giant sucker… Especially you!” he mocks the real world audience watching him. Judging by the show’s decline in quality on TV, audiences might be asking themselves the same thing about Homer’s own move to the big screen. Still, the show remains very popular with fans, signified by its nearly two continuous decades on air. 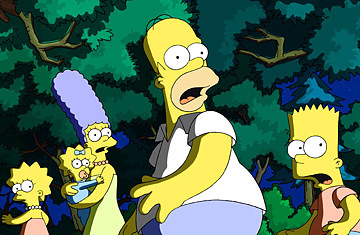 With no end in sight, series creator Matt Groening apparently decided that it was finally time that the Simpsons made it to the big screen! But after all the speculation, and all the hype, and – most of all – all the hope, are fans finally going to be treated to a cromulent adaptation of these long-lasting pop culture icons? Well, the good news is that, while the show itself may be taking a dive, the film may show to us where all the talent has been placed this whole time. 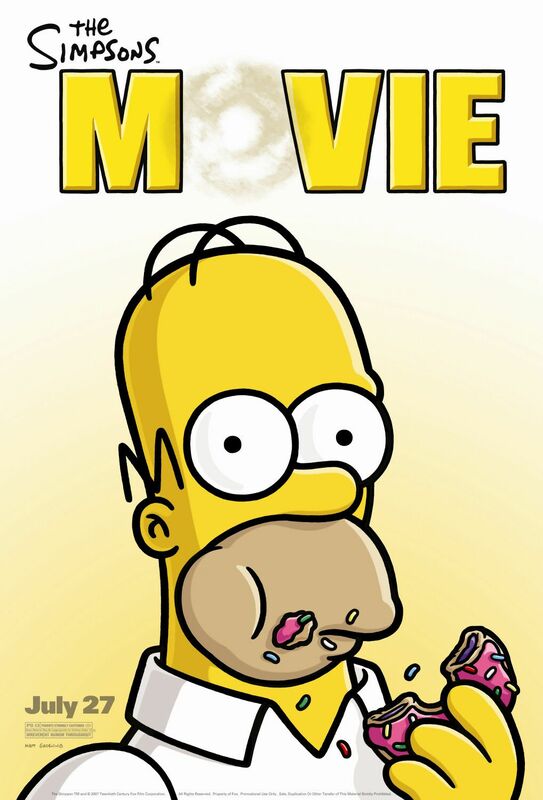 The Simpsons Movie keeps its plot current, as Springfield’s pollution levels have prompted the Environmental Protection Agency’s power mad leader, Russ Cargill (Albert Brooks), to seal the city off under a thick dome. Of course, Homer is to blame, and, in typical fashion, the city ofSpringfield forms an angry mob and runs the titular family out of town, where they, of course, start anew. But when the Simpsons learn of the EPA’s dooming plans for the city, the family is torn between moral obligations and Homer’s stubbornness. Will they saveSpringfield? Will the family come together by the end? And will Homer ever learn his lesson? If you know the series, then you already know the answers: yes, of course, and… maybe. This isn’t exactly new territory, but, for once, the slightly inconsequential plot is mostly inconsequential to the quality of the movie. Aside from a few throwaway jokes (e.g. President Schwarzenegger), The Simpsons Movie delivers on almost everything else series fans have been hoping for, thanks to the return of several pre-decline writers, quality 2D animation, and stellar voicework. The elaborate sight gags, sharp satire, and simple poop jokes shine alike throughout. Dan Castellaneta plays Homer as hilariously childlike as ever, all without devolving into the caricature he’s become on the show. Special kudos goes to Julie Kavner, however, who not only brings back Marge’s heretofore withering dignity as the voice of reason, but also manages to render a few tears in one pivotal, heartbreaking scene. It will surely remind audiences of the impact the series and its characters can have, given the right material and talent. The Simpsons Movie proves that the series’ time hasn’t necessarily come or gone, but rather that it can be just as fun, and funny, as ever. Here’s hoping that it won’t take another twenty years for the inevitable sequel!